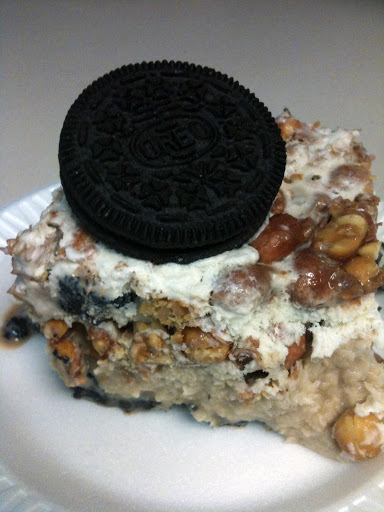 My favorite dessert as a child and one I requested for at least a couple of birthdays growing up was this homemade version of Dairy Queen’s Peanut Buster Bar. It’s so delicious once you’ve had it you will crave it forever. 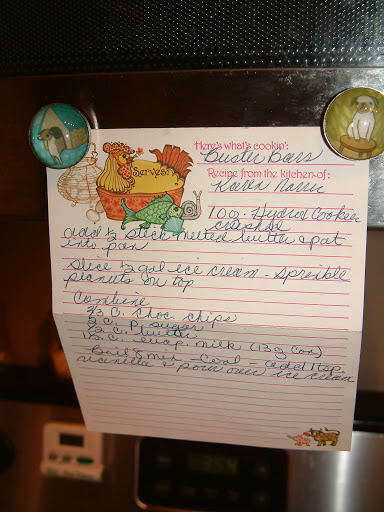 My mom got this recipe from family friend, Karen Norris, as you can see on the recipe card below. One thing I’ve noticed is that my mom’s and grandmas’ recipe cards were very good about citing from whom a recipe came. 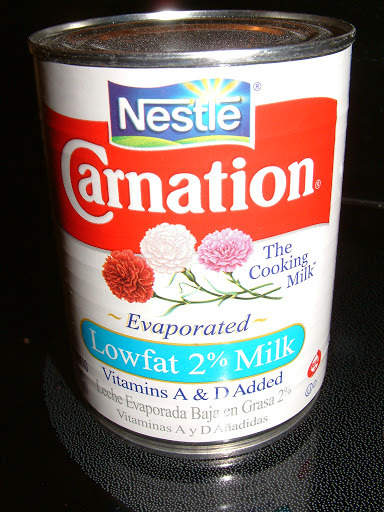 It seems so cute and almost quaint to me how important it was to my mom’s and grandmas’ generations to make sure the proper person got credit for a recipe they shared. I think of the site Pinterest, which I love by the way (pinterest.com/lbentzin/). You see users post stuff willy nilly from multiple sources and often photos get separated from their original links along the way and are floating out there with no easily-discernable owner. Copyright issues certainly can arise quickly, can’t they? Plus the issue of true originality and who owns what all seems a bit murky, if you ask me. I’m sure it’s all very clear cut if you’re a copyright lawyer, but for the average person I think there are a lot of grey areas. For instance, a retailer pays a photographer to shoot their product. The photographer gives up his copyright to the retailer. You, Pinner A on Pinterest, love the product as seen on the retailer’s website and share it with the world by pinning it to one of your boards. The photographer, if he sees your pin, may be sad he didn’t get credit or even a mention for his lovely shot of product X but he gave up his copyright to the retailer. Is the retailer, who now owns the photo and to whom you’ve probably just driven a ton of business by sharing your love of their product, going to care? If anything, I would think the retailer is thrilled. But didn’t you technically use something without permission (the photo) that the retailer owned? Sure you might have linked back to the retailer’s website, thus giving the retailer and indirectly the photographer at least a “shout-out,” but is that enough by today’s ever-changing legal definitions to have avoided copyright infringement? Now, apply it to a song you’ve used in your homemade wedding video. The video goes viral on YouTube, because you all did a wedding dance to Michael Jackson’s song Thriller at your reception (sound familiar?). Can Michael Jackson’s estate sue you because you did not get permission to use Michael’s song in your video? What if your video going viral drove thousands of people to download Thriller from iTunes and brought in lots of additional revenue to the Michael Jackson estate? Or, what if the opposite happened? What if people hated your video so much that they boycotted buying the Thriller song? I peruse hundreds of recipes in books and magazines and on blogs weekly and so many of them strike me as being slight, and I mean very slight, variations of each other. I’m sure we’ve all viewed many exact duplicates of recipes too without even realizing it, because how would we know for sure that we were looking at a duplicate since none of us have a computer-like memory or the time or inclination to compare every recipe we’ve ever viewed side by side with every other recipe we’ve every viewed? So what makes something an original recipe then? What if you think something up on your own and find out later someone else had already created it years before you had? I would argue that unless you’ve invented a new ingredient you probably are duplicating or coming very close to duplicating a recipe someone else has already created, whether you realize it or not. Maybe none of this stuff does violate copyright, though? Maybe it is all covered by Fair Use or Creative Commons? As if you haven’t figured out by my ramblings by now, none of it seems very clear cut to me. However, if I had to try and summarize copyright in a nutshell, I would say that copyright laws were created because they were supposed to protect a person’s ability to make revenue from something that person created, and if a person is making revenue BECAUSE someone is breaking a copyright, I think that can make the whole issue become very sticky very quickly. 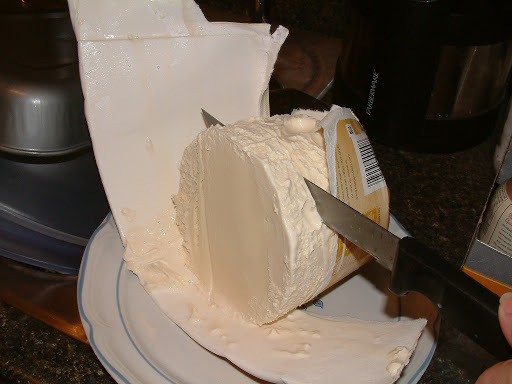 Slice 1/2 gallon ice cream. 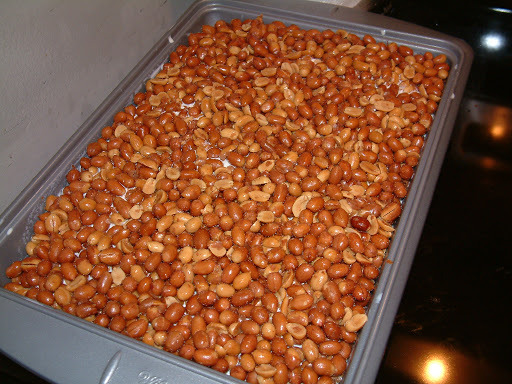 Sprinkle peanuts on top. Boil 8 minutes. Cool. Add 1 tsp vanilla and pour over ice cream. This is the extent of the recipe–pretty much just a list of ingredients, so I will fill in the instructional part, which I made up as I went along (partly from memory remembering helping my mom make them when I was little). 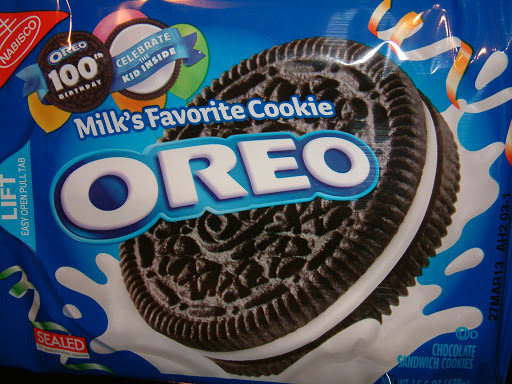 A note about the recipe above–isn’t it quaint that they used to have what I would consider to be a generic brand of Oreo cookies and they used to call them Hydrox? Sometimes my mom would buy the Hydrox brand, I believe they were made by Sunshine, instead of the Oreo brand, and I would be so upset. I said it would “ruin” the recipe. I was such a little diva. Now on to the instructions. 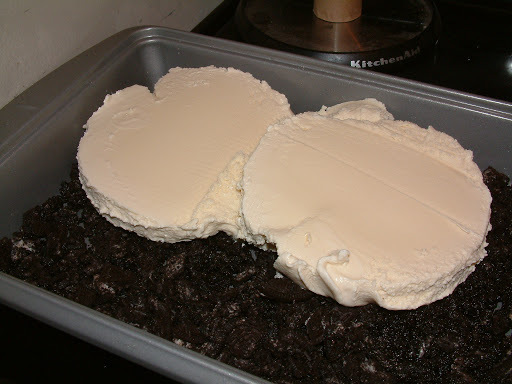 First, I took almost a whole bag of Oreo Cookies and I put them in a plastic freezer bag, and then I took a hammer to them. My poodle was quite interested in this part and came into the kitchen to check out what I was doing. I usually don’t make such a racket. 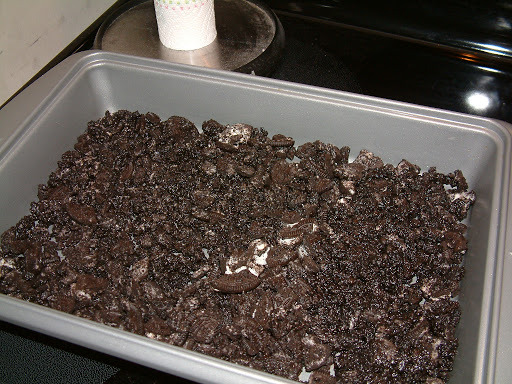 The recipe called for only 10 ounces and a whole bag of Oreos is about 15 1/2 ounces, but when I only crushed 2/3 of the bag, it didn’t cover the bottom of the cake pan, so I crushed the rest, leaving out only a few Oreos for decoration, so basically feel free to use the whole bag, if you like! I threw in another 1/4 stick of butter too, since I was throwing in more cookies. 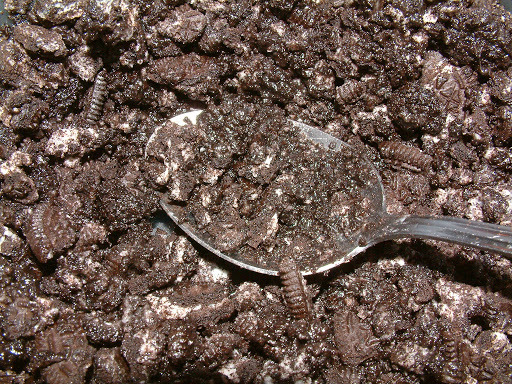 Once I melted the butter in the microwave, I mixed it up with the crushed Oreos. 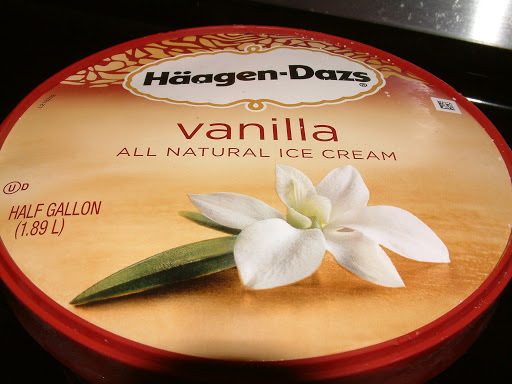 I used Haagen-Dazs ice cream. I’m a bit of an ice cream prima donna. 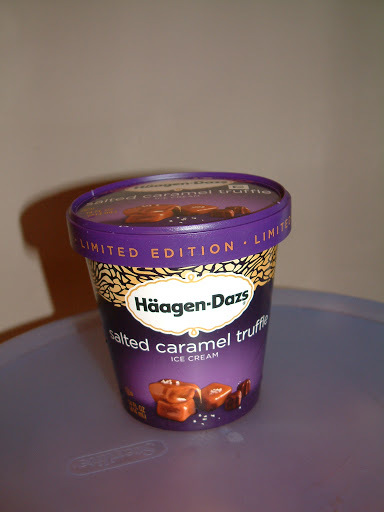 Speaking of, Haagen-Dazs has a limited edition flavor “Salted Caramel Truffle” that has become my all-time favorite. Have you tried it? It’s to die for! 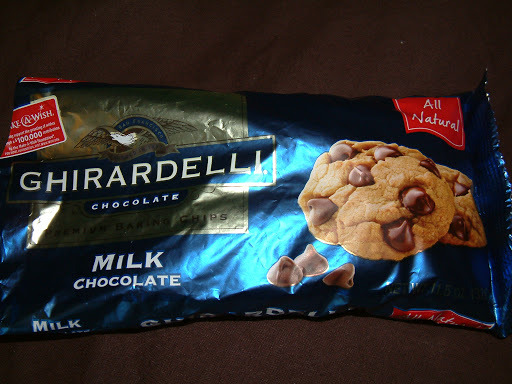 I’m going to have to stop buying it, though, because I’m gaining too much weight. 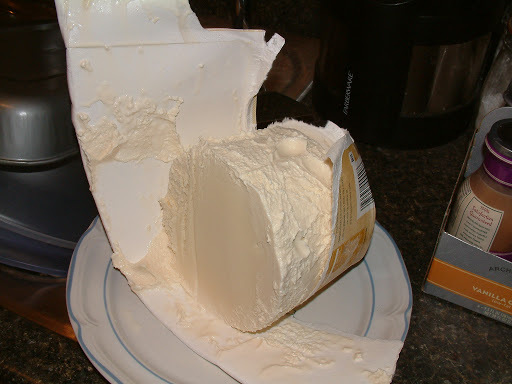 One thing I remember my mom doing, when she made the recipe, is she would cut the outside of the ice cream container away, and then let the ice cream soften a bit, and then slice it up. This makes it much easier to manage. 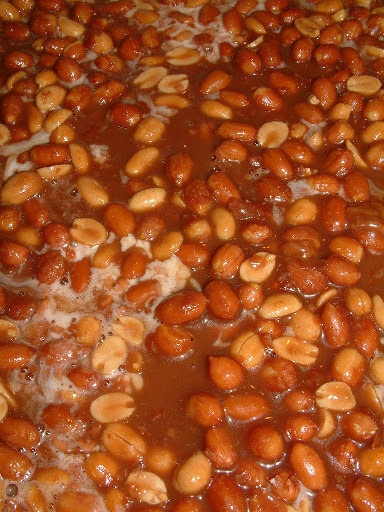 After spreading all the ice-creamy goodness around, it was time to add the Spanish peanuts. Note that the recipe above doesn’t give any peanut quantities. I had two cans, so I added them both. 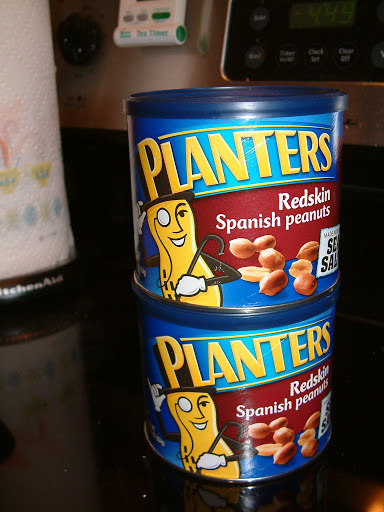 One adjustment I might make to the recipe, in the future, would be to crush the Spanish peanuts first, before adding them. 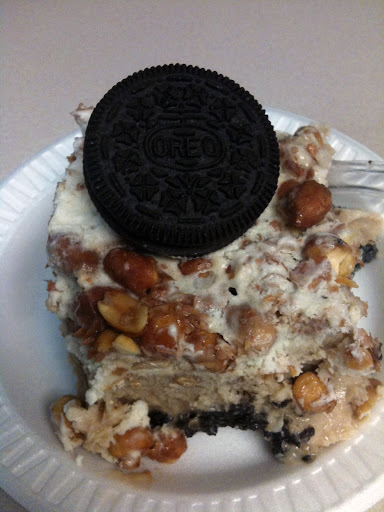 I think that would make the dessert a little easier to eat as those round Spanish peanuts can really turn into little frozen escape artists (so complained one of my co-workers). When the mixture started to boil, I turned the temperature down from high to medium, so it was just a low rolling boil. 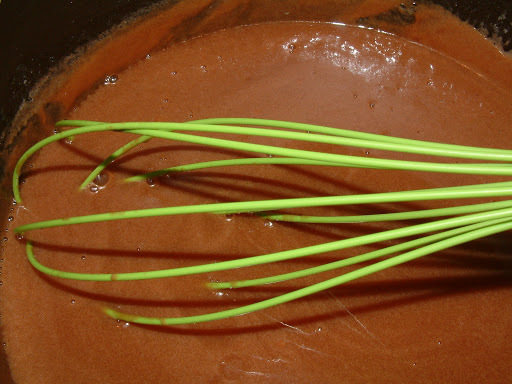 Also, I was sure to whisk the chocolate mix frequently, as it was boiling. I didn’t want any scorched chocolate. I poured the mixture into a new bowl, when its eight minutes of boiling was up, so it would cool down faster. One cooled, I stirred in the vanilla and poured the entire, delightful chocolately mixture over my top layer of peanuts. If the chocolate mixture is still even a tiny bit warm when you pour it into your pan, it might melt down into the lower layers, but that’s okay. 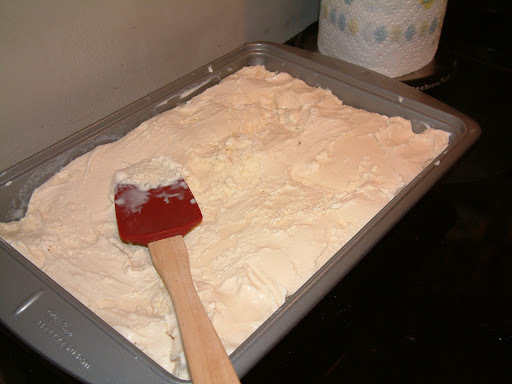 You are going to be covering the pan and putting the whole thing in the freezer right away. It will all freeze together into one chocolately, delightful square of gooey goodness. This entry was posted in chocolate, desserts, ice cream, Spanish peanuts and tagged chocolate, desserts, ice cream, Spanish peanuts. Bookmark the permalink.